After a lengthy and comprehensive site selection process, KPMG, a leader in audit, tax and advisory services, is putting down roots in Vaughan. With a network of more than6,000 people, operating in over 33 locations across the country, KPMG is synonymous with business knowledge. 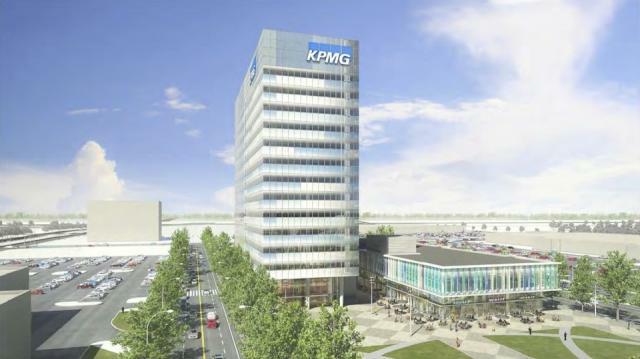 KPMG Enterprise will be expanding its private company practice in the City, signing a lease as a lead tenant on 350,000 square feet of Class A office building located in Vaughan’s new downtown: the Vaughan Metropolitan Centre. A major factor for KPMG’s decision to open a new office in Vaughan, for more than 500 employees, is a result of the City’s diverse and growing entrepreneurial community – more than 90 percent of Vaughan’s 9,900 businesses are small or medium-sized enterprises. “Our move to Vaughan demonstrates KPMG’s commitment to the GTA and our ability to address the business needs of the community. The City’s exciting plans for the Vaughan Metropolitan Centre and the new subway give our people a variety of ways to keep connected with their clients and communities,” said Beth Wilson, GTA Managing Partner, KPMG LLP. KPMG’s new Class A office will be designed by world leading architects, Diamond & Schmitt Architects, and built to meet LEED Gold standards. It will be part of the first phase of a master-planned site being developed by SmartCentres and Calloway REIT. The 53-acre site is being planned for multi-use to accommodate six million square feet of office, retail commercial and residential space built around a central park system, with pedestrian connections to the new subway station and regional bus terminal.